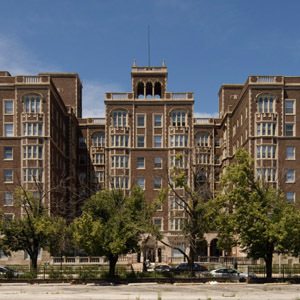 Located in the South Shore neighborhood of Chicago, this architecturally significant 1920s era building consisting of 135 units was in Chicago Building Court when IHDC purchased it in 2011. IHDC had to close down the building when the boilers failed in 2014. The rehabilitation included brand new elevators, exterior masonry restoration, all new plumbing, a new fire safety system, the addition of an exterior and interior ramp, new kitchens in all of the units, a new boiler, new electrical service, a new tenant meeting room, and several other improvements. An architectural gem was preserved and 135 units of affordable housing were saved.